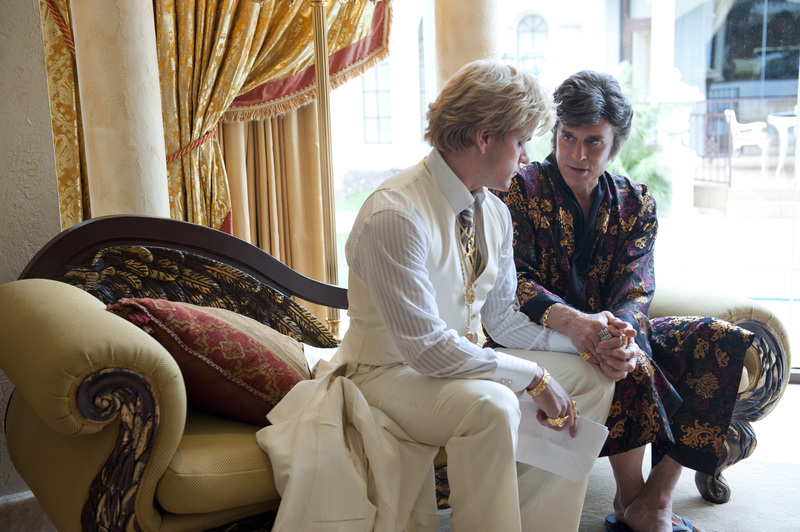 (l-r) MATT DAMON and MICHAEL DOUGLAS star in “BEHIND THE CANDELABRA.” ©HBO. CR: Claudette Barius. HOLLYWOOD—Oscar winners Michael Douglas and Matt Damon are best known for their performances on the big screen, playing fictional red-blooded heterosexual characters. 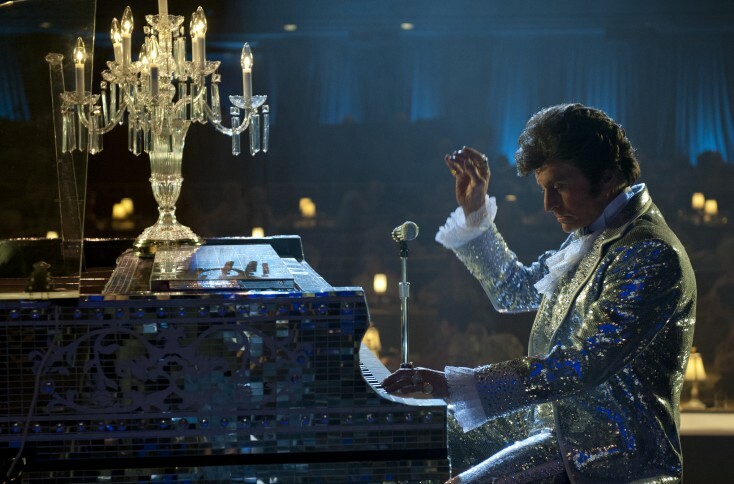 Douglas, 68, is almost unrecognizable beneath the makeup, wigs and outlandish costumes as the charismatic Wladziu Valentino Liberace, better known as Liberace or his nickname “Lee.” Damon, 42, plays the piano star’s young, good-looking driver Scott, who became his lover. Liberace never publicly revealed he was gay, though few were surprised when that fact became known after his AIDS-related death in 1987. The made-for-TV drama is directed by Steven Soderbergh (who directed Douglas in “Traffic” and Damon in the “Ocean’s” trilogy) and produced by veteran Hollywood insider Jerry Weintraub (also of the “Ocean’s” trilogy). The salacious biographical film airs Sunday, May 26 at 9 p.m., on HBO. Q: Michael, can you talk a little bit about the process you went through to get into character? Douglas: There are a tremendous amount of clips and films that certainly give you a sense, an idea (of Liberace), and there’s a lot of repetition involved. First of all, there’s the great Richard LaGravenese screenplay, which set the structure for everything, but (getting into character is) basically a repetition process of looking at a lot of stuff and finding that balance. You’re not an impersonator. You’re not going to ever be exactly like Liberace. So, I was trying to find the balance that makes you comfortable, makes Steven (Soderbergh) secure and makes myself attractive to Matt (Damon). Q: Did you find him attractive, Matt? Q: Michael, you’ve known the Hollywood kind of glamour your whole life: the nice houses, the nice clothes and so forth. But when you step into Liberace‑type clothes and ostentatious setting, what seems different about that? Q: When did the idea of you playing Liberace come up? 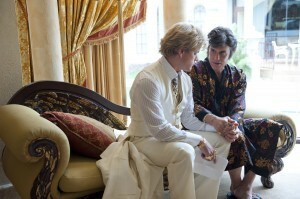 Douglas: We were doing “Traffic” 12 years ago, and somewhere early in the shoot Steven said, “You know, have you ever thought about Liberace?” I looked at him and I thought, “Is this guy messing with me’?” That’s how early I think the idea was going on, and then (it was about) finding the screenplay. I just want to commend Matt, because I don’t think I would have had the courage (to do this) at that point in my career to take this on. Q: Matt, you have some crazy getups in this as well? Do the costumes make you feel different and help you get into character? Damon: Yeah. Certainly. It does help, even the clothes. There were the clothes that were kind of documented; the things that we had pictures of. There were the (original) clothes that we actually had that were used as set dressing. We weren’t allowed to touch them because they’re from his collection, but they were used as set dressing. (Costume designer) Ellen (Mirojnick) did such an amazing job on our wardrobe. I’ve always been somebody who goes into the wardrobe fitting and I just try to get out as fast as I can. When they ask me what kind of shoes, I look for the most comfortable shoes. I look for the most comfortable clothes. I just can’t be bothered with it. But this was a very specific thing, and I probably spent more time in the wardrobe fittings on this than I had in the previous 15 projects. It was literally days and days and days. I really enjoyed it, because I was reading the book that (Thorson) wrote. He really was taken with the glamour of this lifestyle. In the book, he talked about how impressed he was and how exciting he was to be involved in that kind of glamour. Q: Michael, what did your wife Catherine Zeta-Jones say when she first saw you dressed like that? What did she think of the film? Douglas: She said, “Where have you been all my life?” (He chuckles.) No. She has seen the film and is a big fan of it. You don’t get this many chances to have a great script and have a wonderful actor like Matt to work with. We obviously worked together closely. So as far as Catherine’s thoughts, I think she realizes when you get a nice chance like this, you should enjoy it. She was really excited, really proud about the picture when she saw it. Q: Did she offer you any input? Douglas: Did she suggest how to do my makeup or something? Q: I don’t know. You tell me. Douglas: We were very fortunate, very, very happy with all of the people that we worked with. There were appliance pieces involved and hair, a lot of hair work and things like that. And yet, when we saw the film, thanks to Steven, it looks pretty effortless. Q: Did you ever meet Liberace? Douglas: I met him briefly two or three times when my father had a house in Palm Springs (California) and Liberace had a house nearby. We just passed him in the car. I remember seeing him. You couldn’t miss his car. But we never had, like, an evening with him or anything like that. We hear that he was just an extraordinarily gracious, extremely professional guy. Q: Did Debbie Reynolds (who plays Liberace’s mother in biopic) ever share any Liberace stories with you? Douglas: Most of Debbie’s stories, I’m afraid, we really can’t tell about anybody, not just about Lee (Liberace). But she did have some very spicy, spicy stuff to say. Q: Do you consider this film a comedy romp? Did you guys ever start laughing while shooting this? Damon: No. Look, there are aspects of (Liberace and Thorson’s) relationship that were absurd, right? But, for me, there are aspects of all of our lives that are absurd. They’re just not absurd to us because they’re our lives. It was so complex, their relationship. Richard (LaGravenese) so got this dynamic. Whether this was the actual dynamic or not, I completely believed what he’d written and those aspects of the power dynamic. What it felt like was if this was a relationship between a man and a woman, you’d feel at moments like this is too intimate, maybe I shouldn’t be here. But it’s between a man and a man, and I’ve never seen that movie before. So it was fun, but we weren’t giggling about it. We took it very seriously. These were people’s lives and we wanted to get it right. We had the best director possible and we just worked really hard on it and were extremely happy to do it because we know how rare something like this is. Q: At the height of his popularity, Liberace was a laughingstock. People loved him, but they made fun of him. Did he make fun of himself? Did he have a good sense of humor about himself? Douglas: Yeah. I think he had a very good sense and a very savvy sense of showmanship. You’ve got to remember, besides all his popularity in Las Vegas, it was the television show that really made him so well‑known to everybody in the world. He was probably the first person on television to talk directly to the camera and it was one of his great abilities to sort of bring in everybody to it. And with that camp style, there was a genuine quality about him and his performances. He wanted to make people happy. Going along with what Matt said, it was a great love story. These two guys really fell for each other. It’s a story of a couple that fell for each other and a lot of wonderful, funny moments and joyful moments, but it ultimately ended in tragedy. So there is humor to it, but I don’t know if you’d call it a tragedy-comedy. It ultimately ends up where everybody loses out. Q: Matt, can you speak about Scott’s love for Liberace? Was it genuine? Damon: I think his love was genuine, but it was complicated. He was somebody who was a foster kid and was looking for a family, and Lee gave that to him. They had a profound love for each other and it ended badly, but there were a lot of wonderful moments and a lot of ups and downs and a lot of things that everybody goes through in long‑term relationships. I don’t think Scott had an angle the whole time. I think he genuinely fell for (Liberace), which is why he was hurt ultimately at the end.